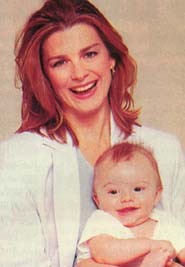 Fiona Hutchinson joined the GL cast as Jenna Bradshaw in 1992. She left in 1994 and returned in 1996, when she reunited with Buzz Cooper and finally told him about their son, Henry Cooper Bradshaw. Harley and Mallet went on vacation after her appointment to the Springfield PD, and they met Jenna at their hotel. A jewel thief, she hid a brooch in Mallet's luggage and followed them back to Springfield. Harley worked undercover to catch Jenna, taking a job as her assistant. Jenna caught on when a clueless Nadine told her that Harley and Frank were brother and sister, not lovers as Jenna had been led to believe. She also found out that Mallet was a cop and put two and two together. She tried to set Harley up for a jewel theft, but Harley was cleared and sworn in as a cop anyway. At the same time, Jenna started receiving gifts from Roger Thorpe, who encouraged her to search for her father. He knew that Brandon Spaulding had stolen a patent from her inventor father and prevented him from claiming his money and his daughter. Henry Chamberlain knew about the crime and felt terrible guilty. He searched for Jenna's father and mother to make amends, but unfortunately they were both dead. In an effort to get Jenna not to sue Spaulding and ruin the family, Henry told her that he was her father and truly came to care for her. Vanessa was jealous of her new "sister" at first, but they eventually got past it and now they're best friends. Jenna broke up with Roger because he didn't believe that Henry was really her father. When Buzz came to town he was instantly attracted to Jenna, and she helped him avoid his children for awhile. He asked her to marry him and skip town, but she turned him down, preferring to stay in Springfield. Buzz and Jenna broke up when he found out she was pregnant with Roger's baby, turning to Nadine for support. 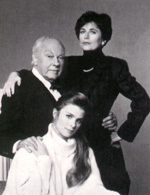 Roger told Jenna that Henry had lied about being her father to protect the Spauldings and she sued the family and won. Henry encouraged her to learn as much as she could about running the company, proving that he really did care for her. Roger was upset by this but didn't have a lot of time for Jenna because of Blake. Roger and Jenna got married, but he was still in love with Holly and she loved Buzz. Buzz told Jenna that she and Roger had gained Spaulding illegally, as Alan-Michael had a document that proved her father hadn't been cheated. Roger thought Eleni knew about the document and had her kidnapped, and Jenna offered to help Buzz find her. Jenna asked Roger for a divorce because of his involvement in the kidnapping, but he told her he wouldn't let her go as long as she was carrying his child. Then Buzz proved the takeover of Spaulding had been illegal and Roger disappeared, leaving behind a pool of blood, and a now penniless Jenna nearly had a miscarriage. Roger turned up again at Holly's, having been shot by Billy. He told Jenna that when she had the baby he would take it away, and she had a miscarriage. She was happy to be free of Roger and went after her true love, Buzz. Buzz helped her convince Alex to invest in her new antique business, unaware that she was planning to steal antiques from Alex. When Alex found out Buzz got her not to press charges by giving back the money and the stolen antiques. Then Jenna stole Eleni's recipe for homemade hand lotion and roped Buzz into starting another business. They didn't see eye to eye about money, however, especially when Buzz gave the $10,000 Jenna had anonymously sent him to invest in her company to Lucy to replace the trust fund he'd stolen. It didn't take long for Buzz and Jenna's relationship to fall apart. She was miserable with life at the diner, while Buzz couldn't think of a better thing to be than the King of Fifth Street. His flashbacks of Vietnam and Nadine's meddling didn't help either, and Jenna left town without telling him she was pregnant with his baby. It would be two years before Buzz would see her again. She returned to Springfield with her husband Jeffrey Morgan and their son, Henry Cooper, Coop for short. Of course it was really Buzz's baby, but it took her forever to tell Buzz that and that she still loved him. Buzz, Harley and Phillip helped her escape from Jeffrey and send him to prison, and Buzz and Jenna were finally engaged and on their way to happiness when, in the worst writing judgement since the Roger gaslighting storyline, Nola began stalking Buzz. He caught on and followed her to the Bauer cabin, where he was mad for all of five minutes before he forgave her, went to fetch some wood for the fire, and promptly fell down the stairs and developed amnesia. Sometimes you've just gotta wonder what the writers are thinking. It would be one thing if Nola had pushed him -- that would have at least been creepy/interesting. Now Buzz is trying to rebuild his life with Jenna for the sake of the baby she is carrying. I've got to give the writers a little bit of credit for recognizing a lousy storyline when they see one -- Buzz overheard Vanessa and Harley talking about Jeffrey's baby at Dinah's almost-wedding and took off, but he came back to Jenna on Christmas and told her that he'll raise Jeffrey's baby as his own. So we won't have to suffer through any more of Nola holding the baby over Jenna's head. Maybe it's because Lisa Brown is going to be on As The World Turns for a few days and didn't have time to fight with Jenna. Whatever the reason, I'm glad it's over. Buzz has his memory back and is on his way to join Jenna in England where she is dealing with her father's estate. The truth is that Fiona is on maternity leave, she gave birth to her second son on March 3rd. When Fiona returns to GL Jenna will have her baby and then Jeffrey will probably come back to stir things up.